Exquisite Sterling Silver Engagement Ring with one of our 1 carat Russian CZs and 1.00 ctw of side stones in a "halo" style around the main CZ stone. The matching wedding band has approx. 1.00 cttw Round brilliant Russian CZ stones. 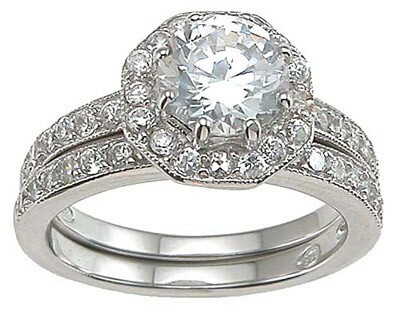 For a total for 3carats in both rings. This is a lovaly CZ jewelry wedding set and has lots of brilliance and fire!